Thickening ultra-hydrating shampoo for the hair’s fibres. Rich in texture, easy to apply and effective cleanser. SALICYLIC ACID: Purifies the scalp to give more volume from the roots, with gentle hydration. Deeply nourishes the hair without weighing it down. 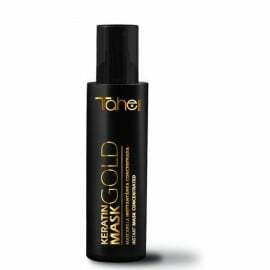 LIQUID GOLD: The oil has regenerative,nourishing, moisturising and heat-protective properties, and is highly valued for its antioxidant effects and ability to rebuild the hair’s fibres. Wash hair, massaging product in gently. Leave to work for a few moments and rinse with warm water. Long lasting botox effect. Hair thickening system in 4 steps. ENDLESS SHINE. THICKER HAIR. EXTREME SOFTNESS. Feel the transformation of your hair, for a thicker, more abundant mane of hair, infinitely shiny and soft, due to the combination of liquid gold and salicylic acid that replenishes the hair’s fibres and expands the hair from within. Why does hair lose its thickness? Hair loss by cm2 from alopecia and the reduction of the diameter of the hair’s fibres, when the follicles entre a stage of malnourishment prior to hair loss. Hair starts to get thinner as a result of several factors such as genetics, age, hormonal stress, and lifestyle and habits.